Are You Left-Eared or Right-Eared? Here is today’s weird question. 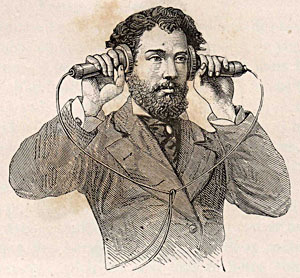 When I talk on the telephone, I always hold the handpiece up to my left ear. I do this because it sounds better that way. A few minutes ago I was on the phone, and because my arm was sore I switched over to my right ear. I haven’t done this for years, but this time I got curious and started switching back and forth, trying to isolate just what it was that was different. Conclusion: when I’m listening through my left ear, the sound is pretty well modulated. When I listen through my right ear, (a) the overall sound quality seems tinnier and (b) louder sounds — just slightly louder, still perfectly normal for spoken voice — seem distorted and unpleasant. This seems sort of odd. Obviously the telephone speaker is the same all the time, and sounds are either distorted or they’re not. If they are, why don’t I hear the distortion through my left ear? And if they’re not, why do I think I hear distortion in my right ear? What’s going on? It’s the latest in a series of studies that show that sound from both human ears is processed differently within the brain. Researchers have noted that humans tend to have a preference for listening to verbal input with their right ears and that given stimulus in both ears, they’ll privilege the syllables that went into the right ear. Brain scientists hypothesize that the right ear auditory stream receives precedence in the left hemisphere of the brain, where the bulk of linguistic processing is carried out. I don’t know which ear I’m most likely to respond to, only that I much prefer the quality of telephonic voices in my left ear. One way or another, though, apparently there’s some kind of cognitively linked difference between your left and right ears. All told, I’m right-handed, right-footed, left-eyed, and left-eared. I haven’t checked my nostrils lately.